Wappwolf is the leading online store for one-click file automation. It automates recurrent manual tasks, such as photo and document editing and sharing, on any device with one click. 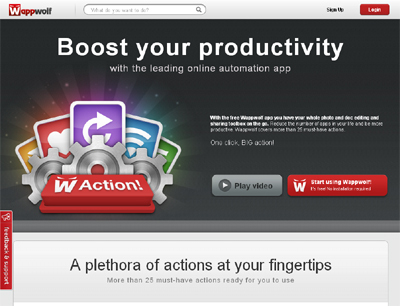 It provides a customizable set of “web actions” – i.e. web-based apps from different developers which are connected – that allow users to share and process multiple files by one click. Files can be of any type. Actions can be started from every device, both manually or by predefined triggers. It increases productivity and saves costs. E.g. Automate your files and add magic to your Dropbox folders. Wappwolf lets apps talk to each other. We are a very early mover in this field. Competitive advantage: User specific saving opportunities, compelling automation, B2C and B2B, easy and intuitive user interface on any device.